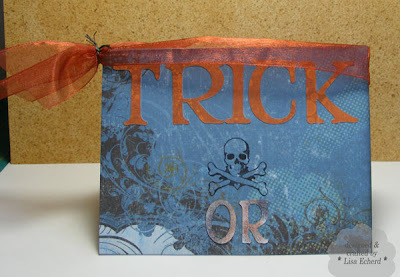 The background is stamped using Anita's Pearl Metallic paint. I couldn't find the Ranger paint dauber shown in the video but found this paint to work fine when applied with a makeup sponge. After drying, I went over it with several colors of Ranger Distress inks. 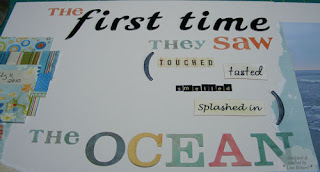 I've experimented with Stampin' Up! Classic inks since they are also dye inks and they work OK, not quite as good as Ranger. I found the colors brighter and harder work work into the crevices. I also experimented with several types of paper and preferred a cheaper quality photo paper. I'm not sure where we bought it - Walmart maybe. It isn't that great for printing but because it is thin and shiny, it really works great for this technique. 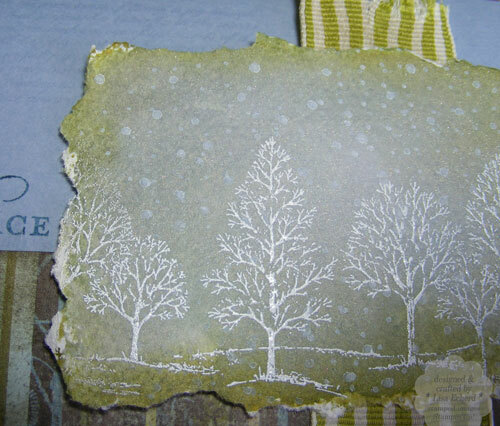 I did the tree much like the video except I had no tree stamp so I just stamped some Mellow Moss cardstock with a couple of backgrounds stamps to add interest, trimmed to a triangle shape and then went over with Peeled Paint distress ink. 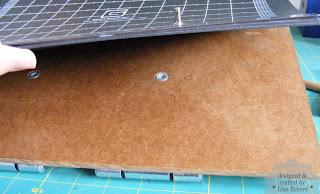 The chipboard 'snow' on the bottom is a piece of scrap chipboard leftover from shaped chipboard cutouts. Be sure to check out Jennifer's great video at http://www.twopeasinabucket.com/. Click on the Thinking Inking ad for all the videos in this series and the projects. I'm definitely hooked. Cardstock: Mellow Moss and Choc Chip by SU! I didn't do a sketch for this week's card. I made 4 of these and they have already been mailed off with my last Operation Write Home box. Most of the cards were Christmas and the deadline for mailing was fast approaching. Anway, I didn't measure the circles and other paper, but I think the outer circles are 1 3/4" and the inner ones are about 1 3/8". I cut the larger circles on the Cricut and the stamped ones with my Creative Memories cutting tool after stamping. The inner circles are mounted slightly off center. 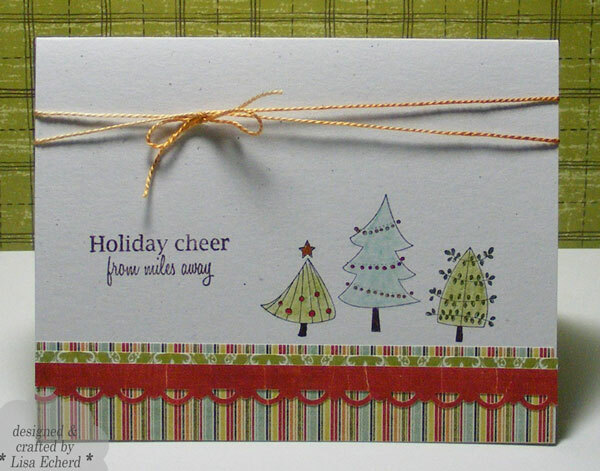 The greeting is stamped on some left over strips of chipboard. I cut them in half with my Stampin' Up! craft and rubber scissors. 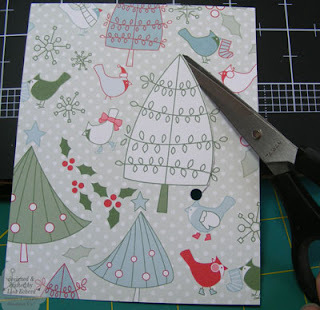 These are perfect for cutting through chipboard. And the Crop-a-dile makes easy work or punching holes. 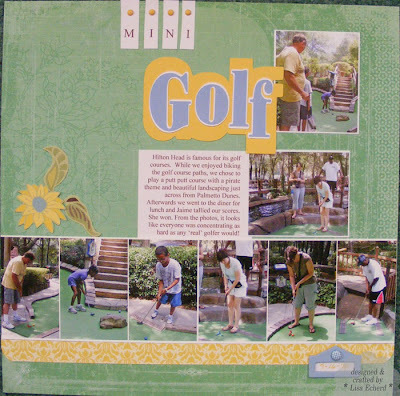 The edge of the large piece of printed designer paper is distressed with Vintage Photo Ink to help it blend in with both the cardstock background and the other designer papers. Much of the time in August and September was spent on events that are getting their own pages (a wedding, trips). I decided to put all the every day stuff in a couple of pages of small photos. This was a really fun layout to put together. 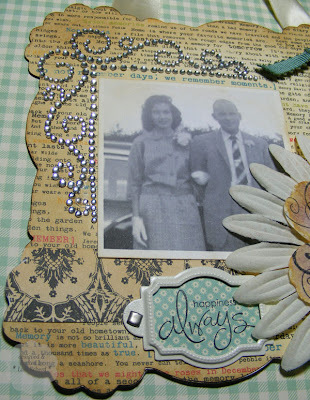 I enjoyed making my own embellishments. Once again I'm reaching for the Indian Summer Basic Grey collection papers. There are also some Crate Paper Mia mixed in. When buying paper, I've got to look for more reds and strong pinks. We seem to wear those colors a lot around the house and they are often the color of flowers and things. These hearts are hand cut and then some are sewn with applique stitching on the machine. 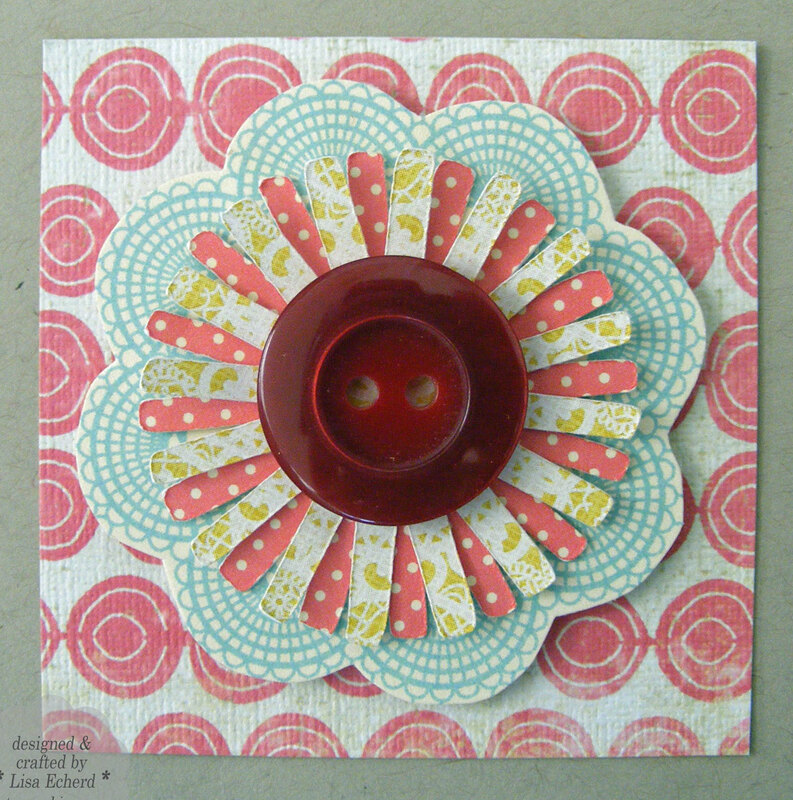 The base of the flower is hand cut from October Afternoon Thrift Shop paper and the inset is cut on the Cricut also from some OA and Basic Grey Nook and Pantry paper. I didn't want to use too much of the same collection. I wanted the flower to look like I'd purchased it separately and mixed it in with another collection. 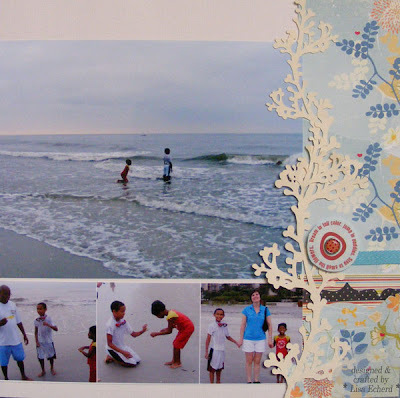 The journaling is just a phrase typed on each photo. There have been a few days I didn't get a photo taken and some days that I just chose not to scrap the photo I did take yet I'm finding Project 365 helps us catch little moments we would normally let go. These are the things I think we will most enjoy seeing later on. DSP Day will be back tomorrow! 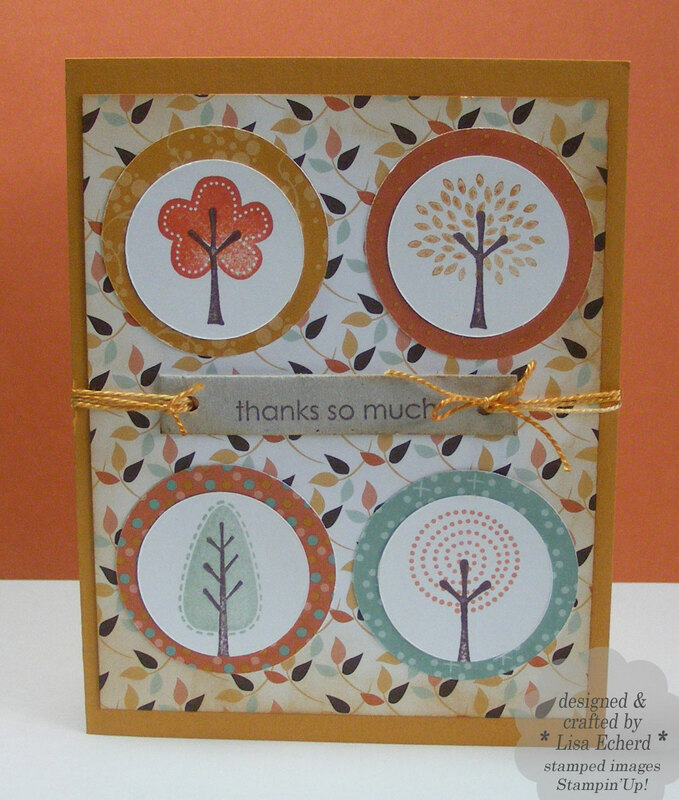 Ingredients: Stamps: Kindred Spirits by Stampin' Up! Brad and Twill Tape: Stampin' Up! The bow is one of my favorite ribbons - organza from the fabric department of Hobby Lobby. It is always pretty and is very inexpensive especially when caught at 50% off. Tis the season for all things glittery! And also the season to get glitter where you don't want it to be like on your ink pads. 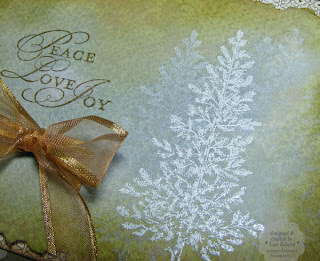 In doing this card, I got some silver embossing powder on my distress ink pad. Removing it is very easy. 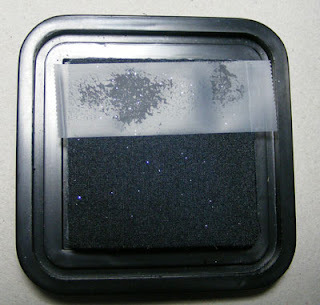 Press tape down on the ink pad and lift off the glitter. I did the background using Jennifer McGuire's method of inking and then spritzing an acrylic block. The ink is then transferred to watercolor paper. See the videos on Thinking Inking at http://www.twopeasinabucket.com/ for more info. After the bacground dried, the snowflakes were stamped and embossed with American Crafts Zing silver powder. The ribbon is white organza from the fabric department at Hoby Lobby. I folded it over and cinched it with some string. Then the brad holds everything in place. 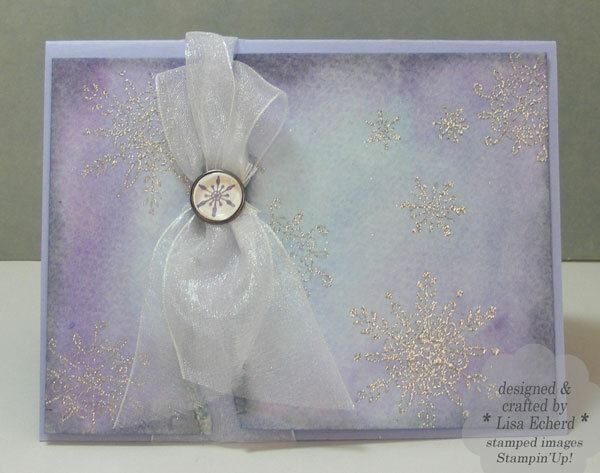 Ingredients: Stamps: Serene Snowflakes by Stampin' Up! 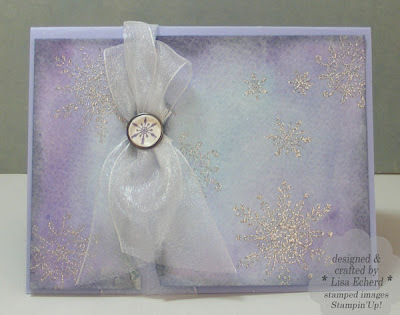 Cardstock: Almost Amethyst by Stampin' Up! Brad: Build-a-Brad in Pewter by SU! 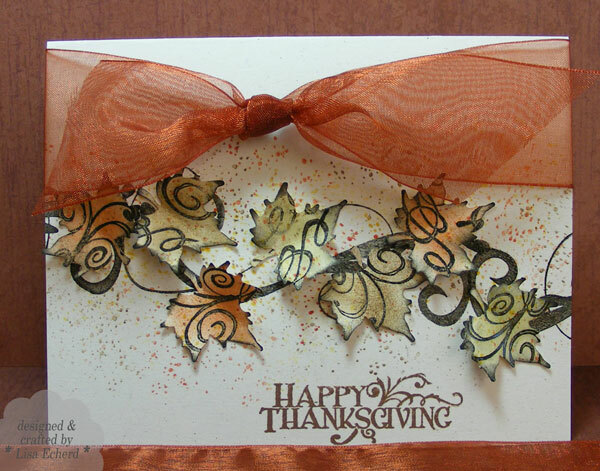 Here's one of our cards for card class this evening. This is a very simple layout that would be easy to duplicate for numerous cards. 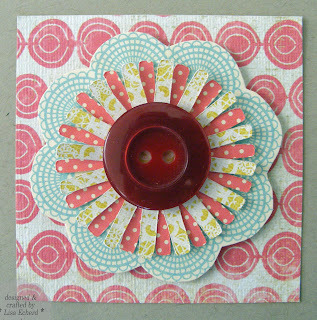 There is a whole punched for the ribbon to go through that the scallop circle covers, shown here from the inside of the card. This saves just a bit of ribbon and keeps the ribbon in place better. Ingredients: Stamps by Stampin' Up! DSP: Raspberry Lemonade by SU! 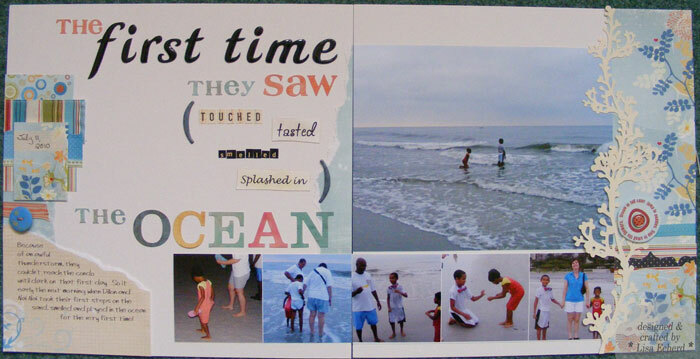 Just finishing up our Hilton Head pages for this year. I did quite a bit more on the island than I have in a long tine since we had the kids with us. On our last full day, all six of us went to play mini golf. Even though the island is full of beautiful golf courses, none of us are golfers. 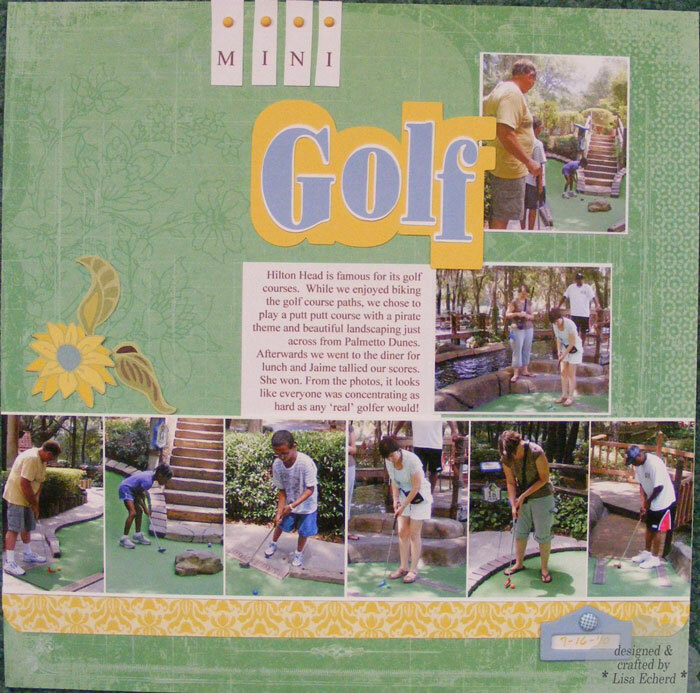 For some it was the first time on a mini golf course, too. 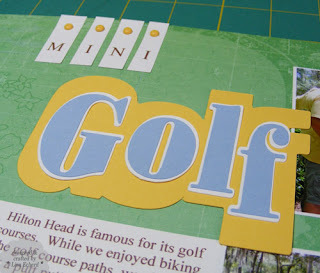 Project Notes: "Golf" was cut on the Cricut with SCAL. I did the yellow backdrop using the shadow blackout feature and welded all the letters together. The photo strip features 6 2" x 3" photos that started out as 4"x6". Since the proportions are the same, I didn't resize, just dragged and dropped the photos onto a 3" high Photoshop page and they sized automatically. Note: There will not be a DSP day this week. I'm busy getting ready for card class on Monday night. There will be many cards appearing on the blog in the next few days. I don't think I've posted any of the class cards yet. 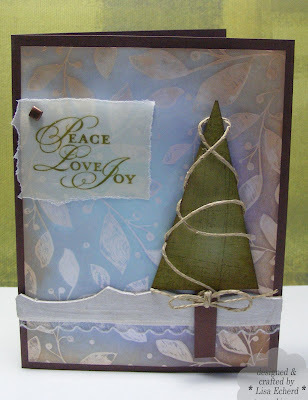 Ingredients: DSP: Clothesline collection by Little Yellow Bicycle; Greenhouse Gala by Stampin’ Up! 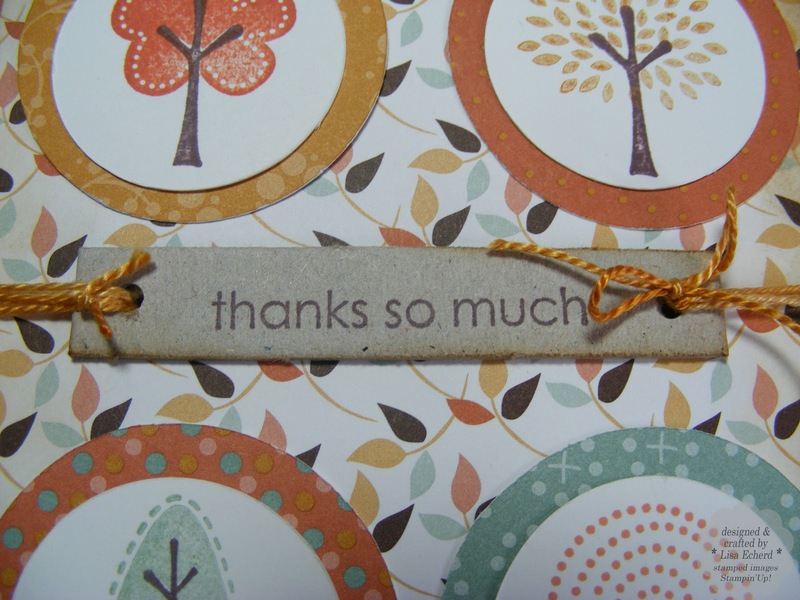 For my aunt to send as her cards, I CASEd this card from the Stampin' Up! 2010-11 Idea book. I used Home for Christmas set last year for my cards and this year I'm rotating the sets around so everyone gets a fresh look on their cards. 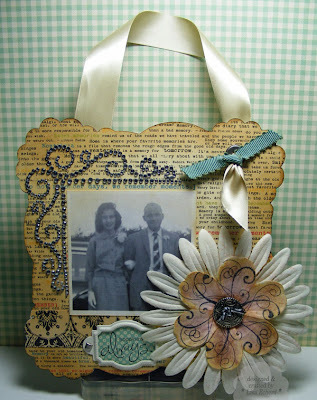 I'll also make cards for my Mother and for me to send. 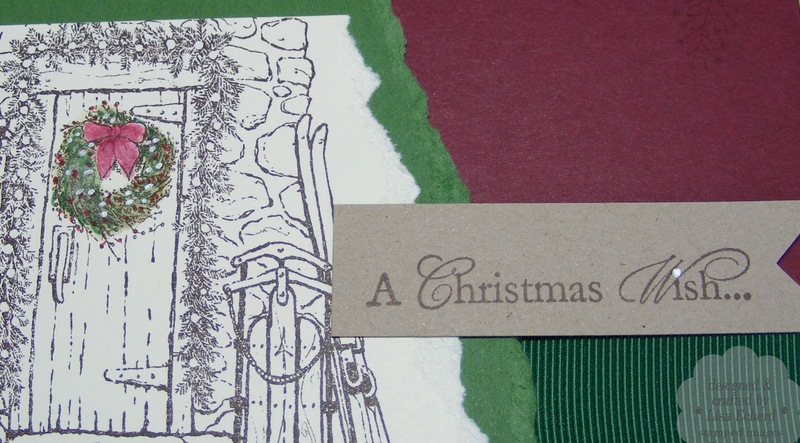 The catalog card had little jewels for dotting the 'i' in Christmas and on the wreath. To keep the bulk down for mailing, I used a silver pen from Creative Memories. The wreath is colored in with a combo of markers and watercolor crayons. Since marker colors run with water, I used the marker first and then went over everything with a crayon and blender pen for a 'blended' effect. 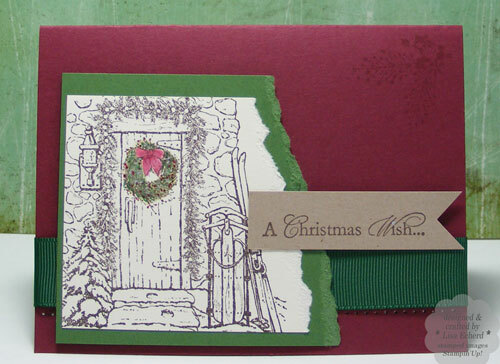 Cardstock: Scarlett Jewel from PTI; Garden Green and Crumb Cake from SU! Who doesn't love a deal?! Stampin' Up! 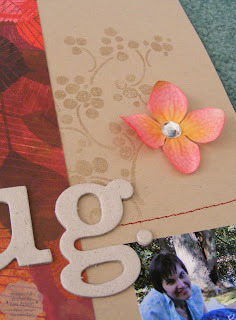 has a bunch of stuff on close-out from the last catalog at http://www.stampinup.com/ Go to Store and Clearance Rack. Remember that several of last year's In Colors are part of this year's current colors so the marker pack and the paper pack are especially great deals if you don't alreay have them. 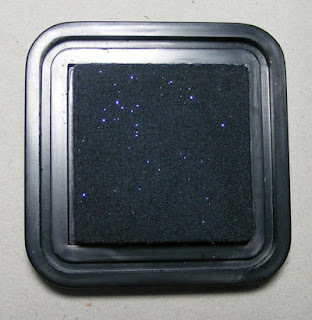 There is a link on my site to my demonstrator Jean. Use a demonstrator's store for the lowest price. Also http://www.twopeasinabucket.com/ is having a free shipping on orders over $25. This is just for a couple of days. What a great time to pick up a few of those things on your wish list! My problem is that my wish list just grows and grows! 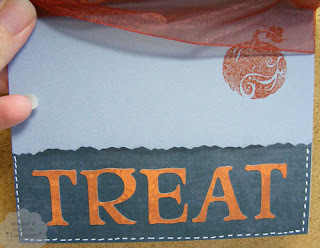 Finally, last year http://www.addictedtoscrapbooking.com/ had a big Thanksgiving weekend sale. I don't know if they are doing that again this year or not but it is something to think about. Yesterday, I was wondering what I would do for TIPsy Tuesday today. About a half hour later I was frustrated that I couldn't find a new SU! 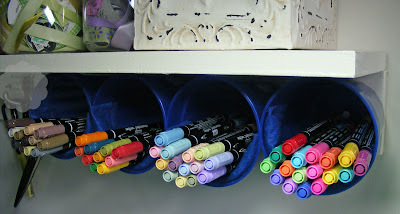 marker amid my marker chaos drawer of loose markers and ones packaged with the old color families. I've been wanting to get them out of that drawer and more at hand. Seemed like the perfect time. I bought plastic drink cups at Dollar Tree - 3 cups for a $1. I lined part of the inside of the lip of each cup with several folded layers of felt. This is to build up this edge so the markers will lay more level keeping both ends moist and keeping them from falling out. 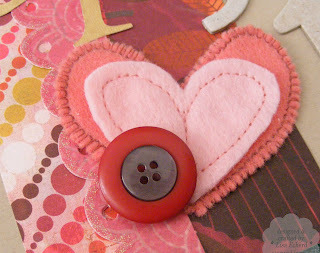 I sewed the layers of felt together before gluing in place to reduce the amount of glue. One row of Glue Dots Continous Line held each in place. The cups are then screwed through the bottom to a board supporting a shelf over my work table. So far my arrangement is using the new color families with the old markers mixed in where appropriate - example: Soft Subtles are with Subtles. Earth Elements will go together with Regals since I never bought the Rich Regals markers. Hopefully, I'll use my markers more now that they are at hand. Happy day! Thanks for visiting. Don't you just hate to cover up so much of your pretty designer paper with other card layers? Well, cut it out! That is, cut out the some of the design being covered up and use it somewhere else on the card. 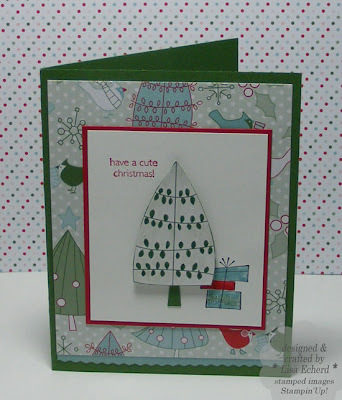 Here's an example using the Candy Cane Christmas paper from Stampin' Up! These little trees are just perfect to cut out and use separately. Yet the rest of the paper's smaller elements are very pretty too. I cut this out carefully starting in the middle of the paper. Then I colored in parts of the tree since it was just a line drawing. 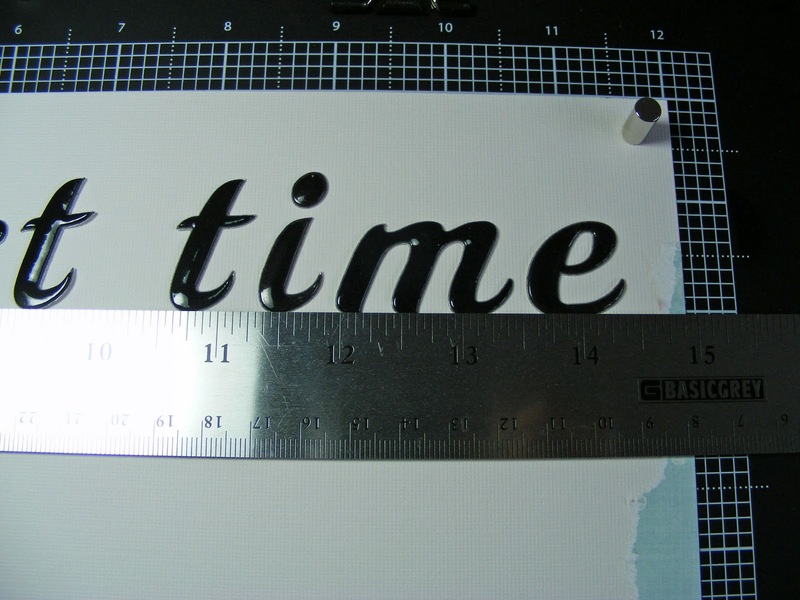 Often you can use the cut out element without further embellishment. The only thing to be careful of is to use good cardstock behind the are you have cut out. You don't want a 'hole' to shine through if someone handles your card with light shining behind it. Otherwise, no one will be the wiser of your frugality. Thanks for visitng today! Hope you'll find lots of creative ways to use those pretty papers. 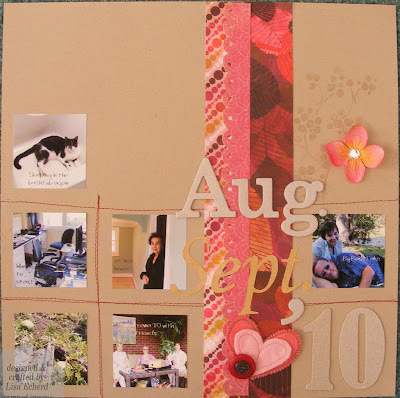 One of the joys of scrapbooking is getting to relive an experience through the pictures and process of putting together a layout. 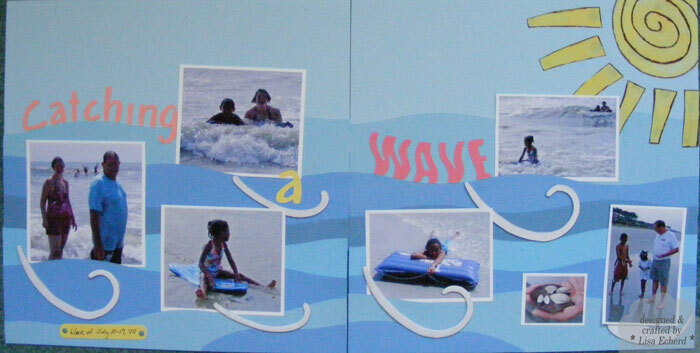 I remember the hot sun, cool sand, and big smiles of everyone playing in the waves this summer. 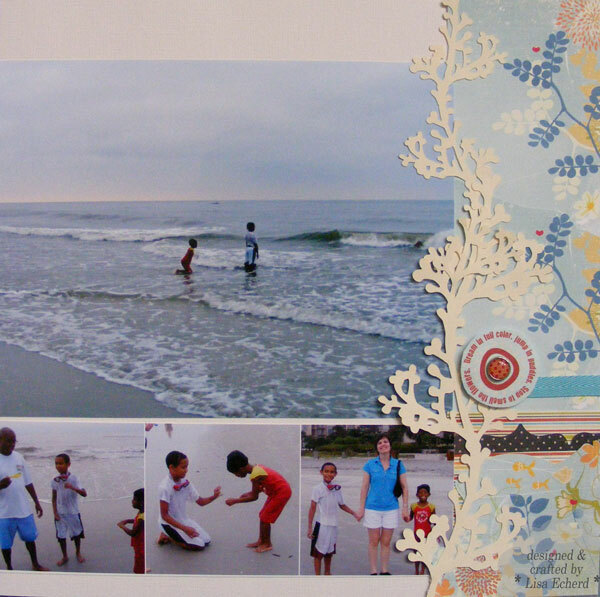 I didn't have any pattern paper to really compliment these photos so I pulled lots of blue cardstock from my stash. 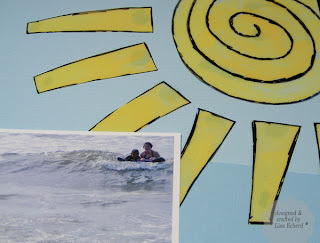 For the sunshine, I was wary of painting or stamping right on my background figuring yellow would not show up that much. 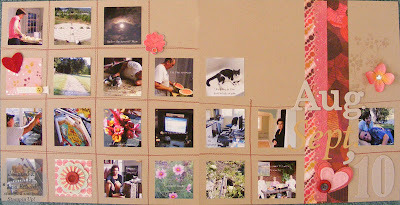 I remembered a technique from Erika Ghumm, contributor to Scrapbooks, Etc. magazine. Print or stamp a line art design on the front of a transparency and then fill in the lines with paint on the back You don't have to be overly precise as the lines hide the edges of your painting. 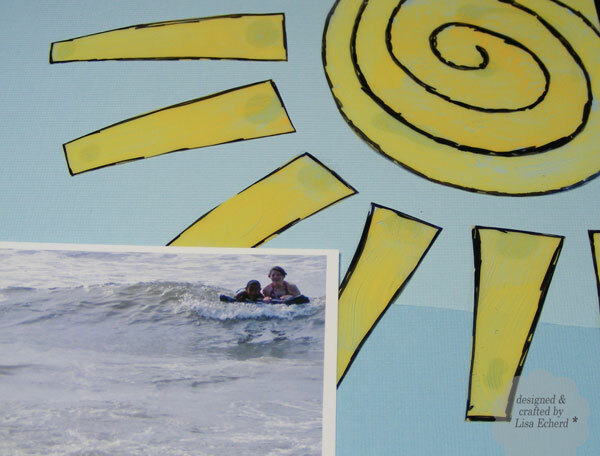 I hand drew my sun and rays with a Sharpie before painting. Then just cut everything out and glued in place. The transparency gives a nice finish that doesn't show in the photo. The whitecaps are chipboard elements I've had forever from Oriental trading. 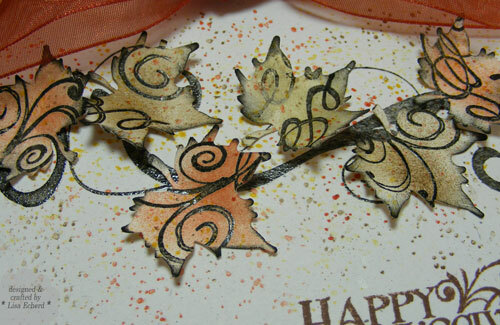 They are painted and then sponged with Whisper White craft ink. 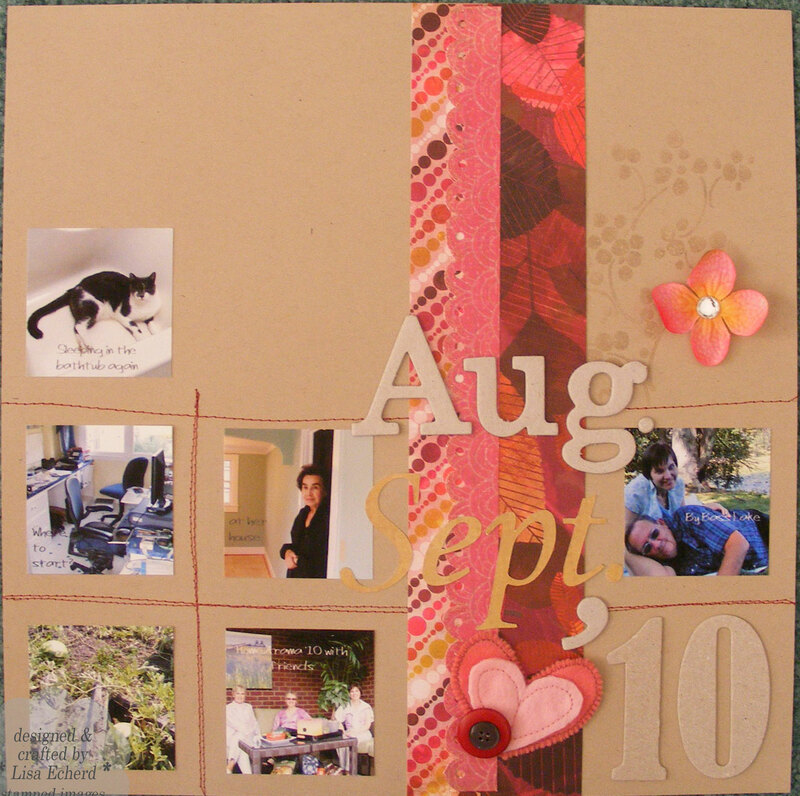 It was wonderful to remember such fun summer days and nice to work through some of my stash. Following this week's video by Jennifer McGuire, I did two samples of inked backgrounds and then stamped and embossed trees on them. 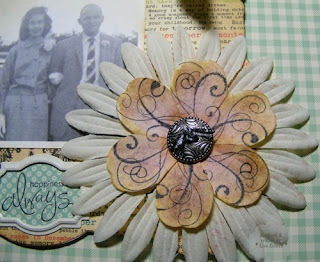 This smaller sample fit perfectly into Splitcoaststampers card sketch for the week. For both cards, I inked my acrylic block with Weathered Wood and Peeled Paint distress inks and then misted. 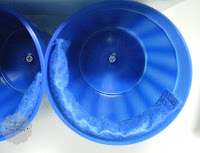 I can not find my water mister! So I used Angel's glimmer mist instead for a nice effect. Then I pressed the block to watercolor paper and repeated as necessary to get enough ink coverage. I probably would not had to have repeated if I'd had just water. 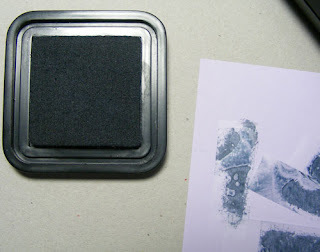 I then spread the ink with my fingers which caused a lot of staining - my fingers, not the paper. The paper looked very nice. Next time I think I would spread the ink with something other than my fingers! I let all this dry overnight since I wanted to do some embossing. 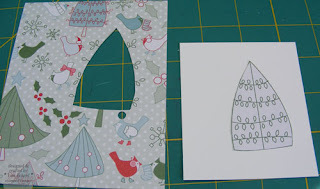 The trees on the first card and the main tree on the second are stamped in Versamark and embossed in white. The shadowed trees are just stamped in Whisper White. The ribbon is raveled and inked as well to go with the aged look. To create the background for the first card, I stamped some images - script words and flourishes in Versamark and then inked the entire card in Weathered Wood. Ribbon: Old Olive by SU! ; Gold source unknown. 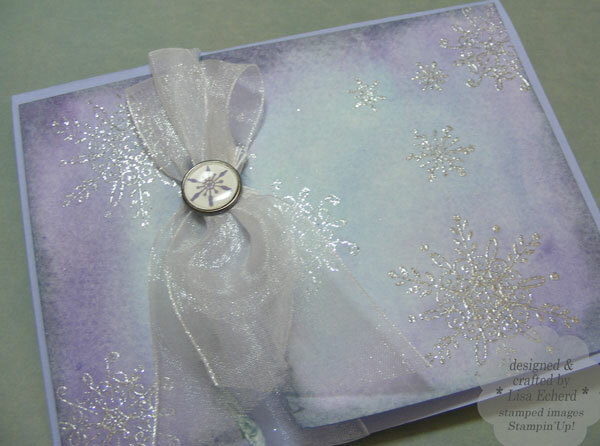 The front of the card is mainly a designer paper from Basic Grey. It was heavily distressed and really perfect for Halloween. I just stamped the skull and bones. 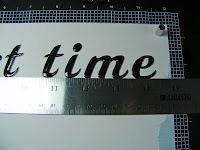 The letters are cut with SCAL software on the Cricut from a font I downloaded from dafont.com. The sheer ribbon was meant to disguise a mistake I made on the front but I really love the effect. It looks like a pirate's bandana or whatever the head wrap thing is called. Now I just have to figure out what the treat is going to be and get this in the mail. A 9 year old boy - what would he like? Halloween treat suggestions welcome. Thanks. Ribbon: Hobby Lobby fabric dept. 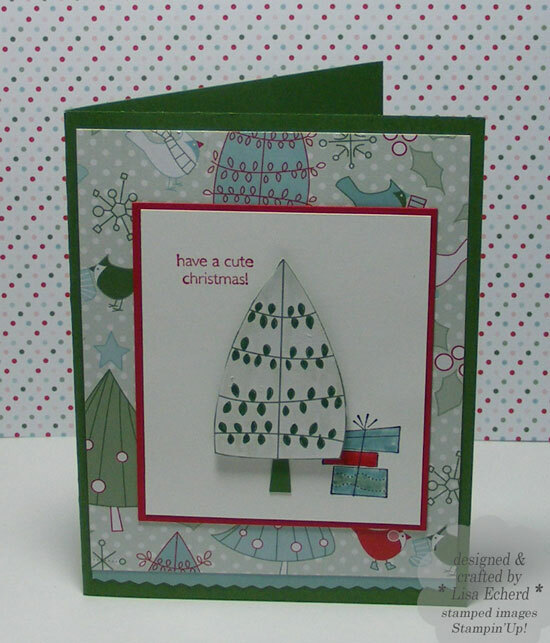 This is the first holiday season that I have actually purchased an entire paper collection themed for the holidays - Candy Cane Christmas from Stampin' Up! It's very pretty and I'm enjoying working with it. However, it is very holiday themed so come December 26 it will get put away for a year. 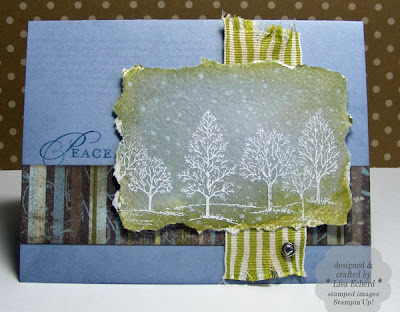 What I normally do is pull papers, embellishments and even some stamps from my regular stash. 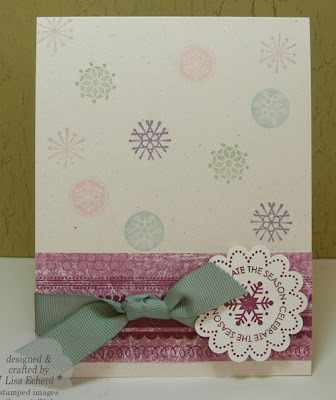 naturals white cardstock from Stampin' Up! DMC cord bought on close out at Hobby Lobby. 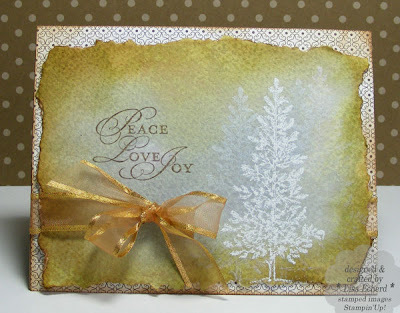 It is kind of a mustard color but it matches the paper and the 'lights and star' I colored in for the trees. 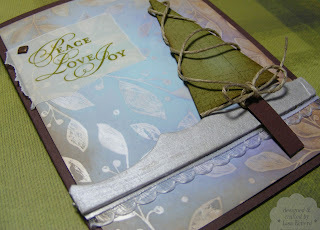 the message stamp is from Mailbox Greetings - an all purpose set from Papertrey Ink. I love to buy Christmas stamps but they can get limiting and it really adds up for one holiday. So 'shop your stash' and find many great things to use for this year's holiday cards. One project note: To keep the trees light enough, I used watercolor crayon and blender pen for coloring the base and then markers for the decorations. A friend who loves trains just had a big birthday last month. This card is made from the Oliver collection kit. While "Oliver" was designed for boys having less monumental birthdays, it is perfect for the train lover, too. Project Note: The "Whoo Hoo" is stamped using the "Whooo loves you" stamp set. I used markers to ink the letters I wanted from "Whooo" where I wanted them. Happy Birthday, Jimmy! Hope you had a great day. 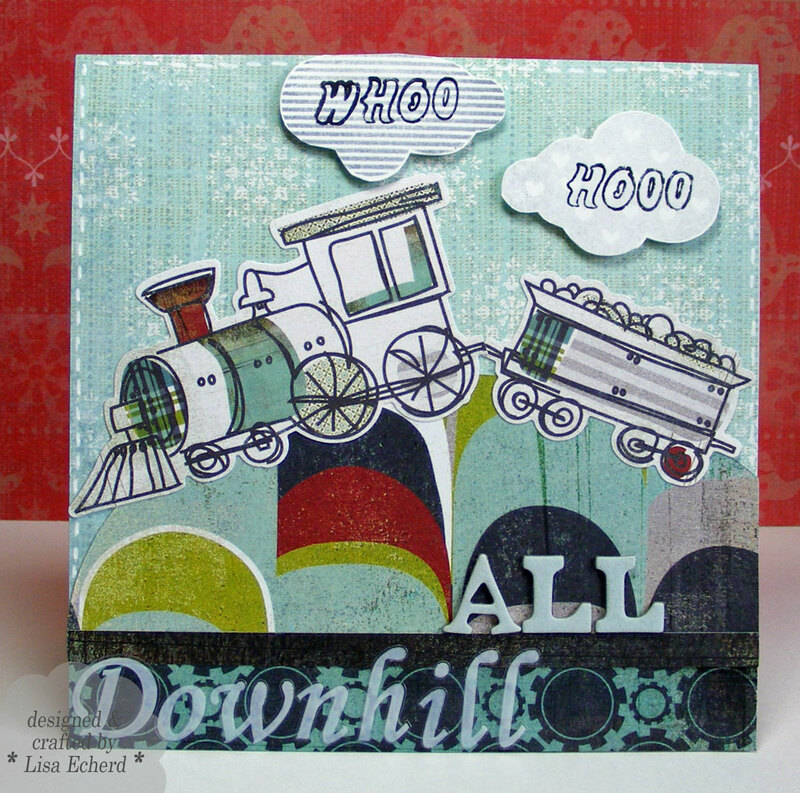 DSP and train sticker: Oliver by Basic Grey; Western Sky by SU! 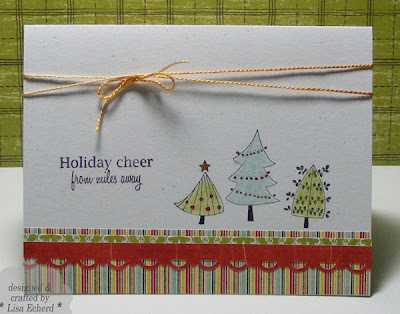 Consider using some of your pretty designer paper on the inside of your cards too. You can often stamp and write on tone-on-tone or light backgrounds. The designer paper on the inside of this card shows through the stamped transparency layer so you get a pretty view open or closed. The card is cut on the Cricut with SCAL software. 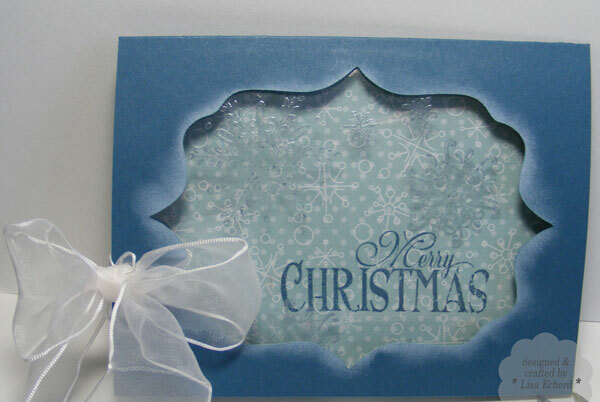 The transparency film is stamped with Bordering Blue craft ink and then embossed using clear powder. It gives a pretty texture and a light bit of color. Keep the heat gun moving when embossing transparency film and always guard your fingers. I used ink jet printer film. 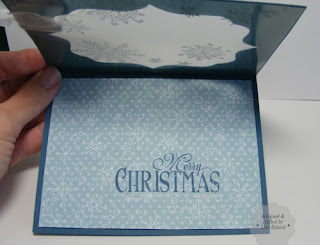 Whisper White craft ink is sponged around the edges of the cutout to accent the inside further. DSP: Candy Cane Christmas by SU! My parents have a wedding anniversary coming up soon. They have been married for over 50 years! 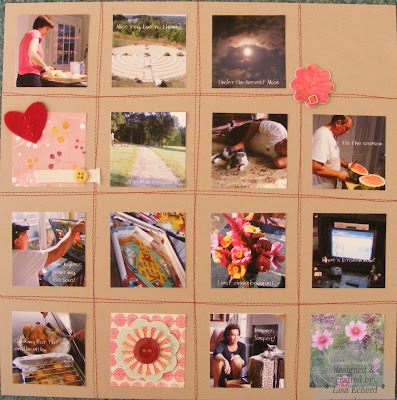 Instead of a card, I did this 6 1/2" square design my Mother can display and remember her wedding day. This is the only photo taken on that day. They couldn't afford a photographer and my Aunt Betty took this picture after Mother had changed into her going away outfit. I had scanned the photo for their anniversary party a few years ago. I just printed another one and distressed it. There is a lot of distressing on this as I was trying some favorite techinques and some new ones from Jennifer McGuire's video for Two Peas in a Bucket. This starts an 8 week class they are hosting on 'inking.' Linked here: http://www.twopeasinabucket.com/events/9-holiday-thinking-inking-2010/The video was very well done and I look forward to more of these. 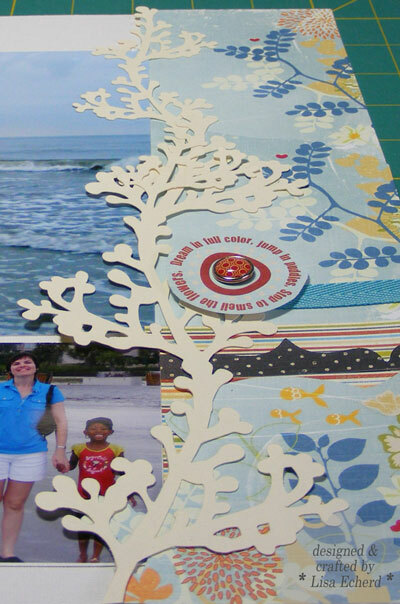 The background paper and a light chipboard base are cut with the Cricut and the Storybook cartridge. I used Ranger's distressing tool featured in the video to add quite a bit of Vintage Photo distressing ink to the edges of the papers. The flower started out white but is colored with 4 blended colors of distressing ink and then stamped with a flourish in Basic Gray ink from Stampin' Up! My Mother found that button for me when we were out shopping one day so I thought it would be a pretty touch for the flower. We are planning a trip to the Grove Park Inn in Asheville for brunch one weekend. My friend Karen reminded me of this treat the other day. Daddy loves their brunch and Mother loves the shopping in Asheville. October is such a pretty time to visit the city nestled between the mountains. It will be a treat for all of us. Metal frame: Vanilla Hodgepodge Hardware from Stampin' Up! 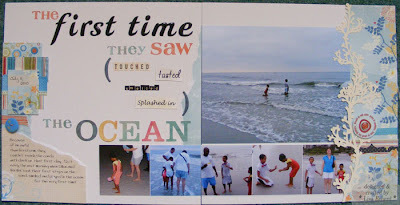 The children had never seen, tasted, smelled, or splashed in the ocean! It was our pleasure to introduce them to the Atlantic. All the designer paper is from an 8"x8" pad so I spliced together some papers for the right hand border. The 'seaweed' branch is cut in two sizes with the Cricut Storybook branch border. Basic Grey's Magnetic Mat (featured in yesterday's post) made lining up these letter stickers a lot easier! It's starting to turn cold here in NC. Wouldn't a walk through the edges of the water on a warm day feel great? A couple of months ago I started having some awful neck and shoulder pain. It is much better now after time and many adjustments to the way I do things. My crafts were not the cause of the problem but they did contribute to the aggravation while it was going on. Tilting my head down was a particular problem. 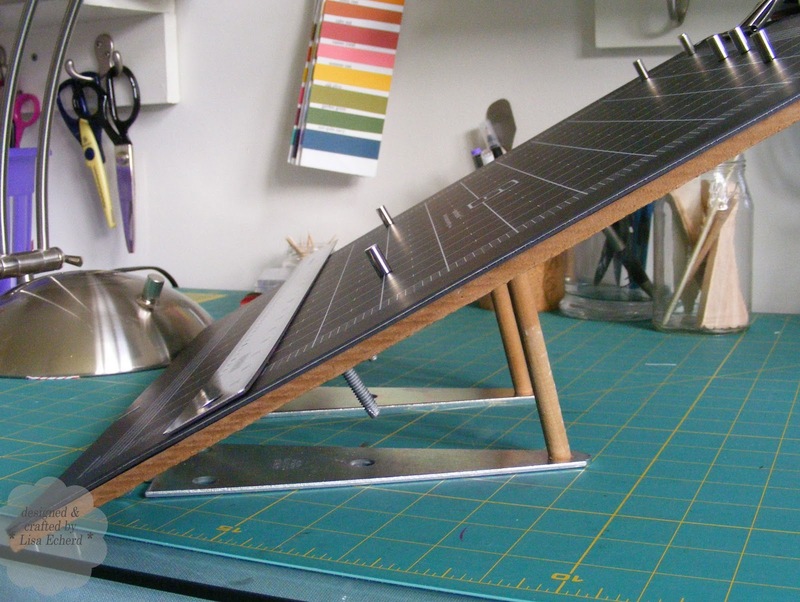 During this time I noticed on some Internet videos the Basic Grey Magnetic Mat being used for scrapbooking and card making. It was positioned flat on the work surface. Yet, I wondered if everything was held on with magnets, couldn't I tilt it so that it would be easier to see and reach the items I was working on? Basic Grey Magnetic Mat kit including 8 magnets and magnetic ruler - available through Amazon.com or Two Peas in a Bucket. A piece of masonite cut 15"x15". Any firm board will work. Two bolts to attach the hinges to the masonite. Be sure to countersink the screw heads into to the board so you have no lumps beneath the mat. Two binder clips to hold the mat to the masonite. I didn't want to attach it permanently. This way I can take it off and use it directly on a work surface. 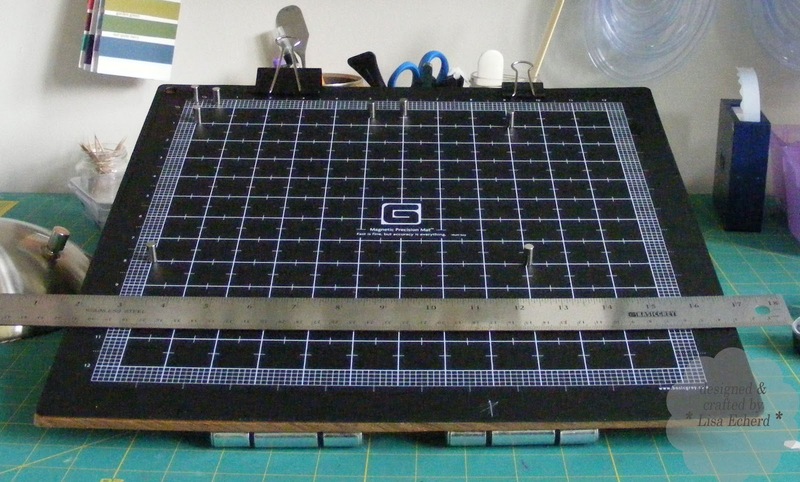 The mat also works as a cutting mat and I would probably want it flat for cutting. I still have my regular cutting mat available. Two small dowels cut to a length that will achieve the desired angle. I just bought a dowel rod from Lowes when I got the hinges. 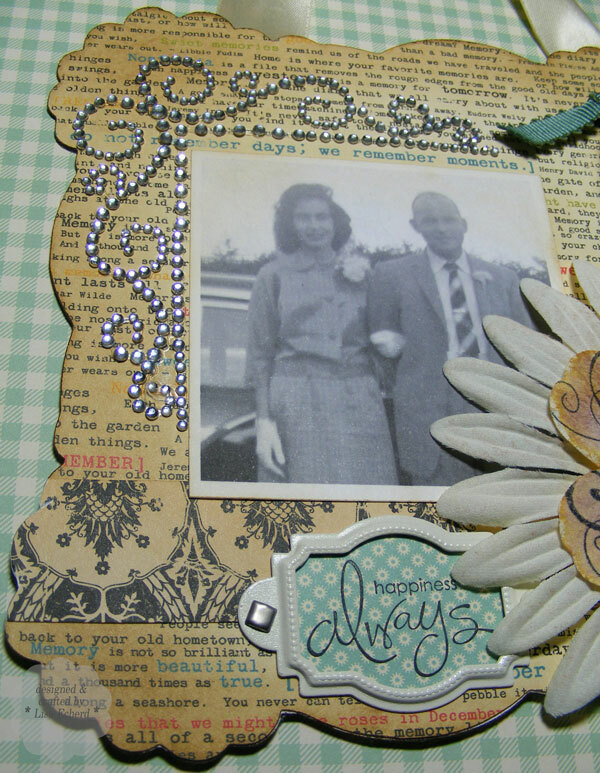 I really love this system for scrapbooking! 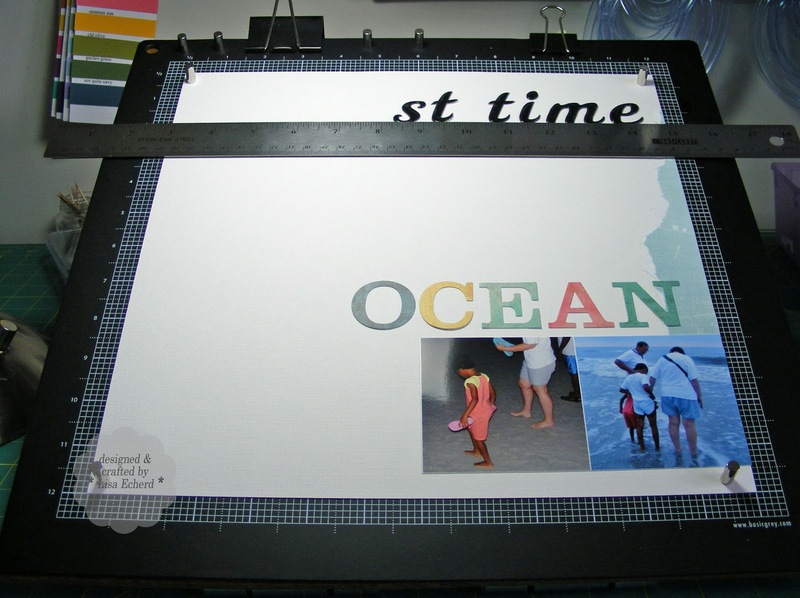 With the ruler and all the edge markings on the mat, I can line up letters, photos and embellishments easily on my scrapbook pages. The magnetic mat is a great tool even if you want to just use it flat and not tilt as I have.